The design will save energy and reduce toxic electronic waste – welcome news for data centers, gamers and anyone with high-end electronics. One way that the researchers tested their technique was by printing the Binghamton University logo onto silicon with the 3D metal laser printer. Lower operating temperatures will improve the energy efficiency of data centers by about five percent, which can save $438 million dollars in electricity and can prevent 3.7 billion pounds of carbon dioxide from being emitted per year. 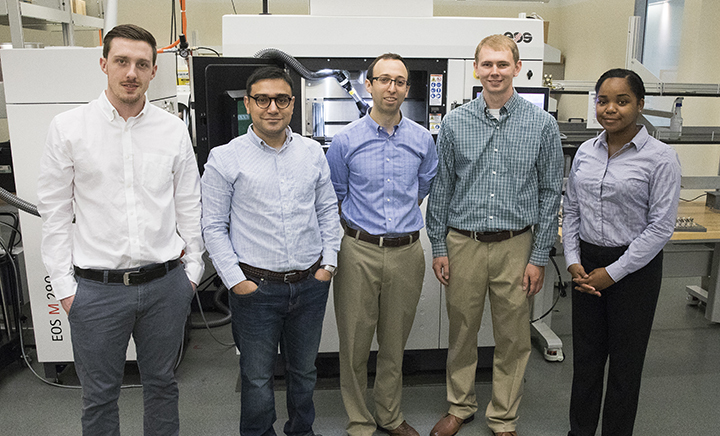 Assistant Professor Scott Schiffres (center) with students working in his lab in front of the 3D metal printer used for this research. The SUNY Research Foundation is investing in patenting this advance for using laser and other rapid bonding techniques to manufacture heat removal devices on semiconductors. Schiffres team members are exploring customer demand for initial and potential use cases through the National Science Foundation (NSF) I-Corps training delivered by the Binghamton University Office of Entrepreneurship and Innovation Partnerships.